If you’re wearing a Michael Kors bag and carrying an iPhone X when shopping at Moroccan-like bazaar, most likely you will be charged more. You probably don't expect the same to happen when shopping online, but actually, you should. Price discrimination exists in ways you can’t even imagine. Let’s say, I laid eyes on my must-have summer dress. It’s a bit pricey. Thus, I go back and forth about buying it while also thinking if I need it. Every time I return to the same e-store, my computer sends back the information to the server, which detects that I’ve returned to the page. What does it mean to the e-store? The same what it means to me — this is my must-have dress, and most probably I will buy it. An interesting thing is that the site owner might know it before I do. They can either give me a nudge by lowering the price or hike it because they know I’m determined to pay whatever they ask me. Marketers may tell where the buyer resides based on their IP address, browsing history, and thus start trailing targeted prices. For example, in locations with a higher average income — and a perhaps wider selection of goods — consumers are usually shown lower prices. When you visit a particular page, its owner instantly sees your “profile” (basically, it’s like an advanced Tinder). Everything is on the table: your gender, age, location, occupation, hobbies, purchasing habits. They may also see if you’re planning a vacation, whether you’re a loyal customer of the brand, and finally — how much you’re willing to spend. Based on your online shopping profile, browsing history, and device you’re using web owner offers you a certain price. Amazon, for example, changes price on its products 2.5 million times a day, meaning that on average a single product’s price is personalized every 10 minutes. Oddly enough, the so-called first-degree discrimination of charging different customers different prices for the same item is a common practice among e-shops and is a completely legal practice. However, price differences can’t be based on race, religion or national origin, but other than that — you’re good to go. 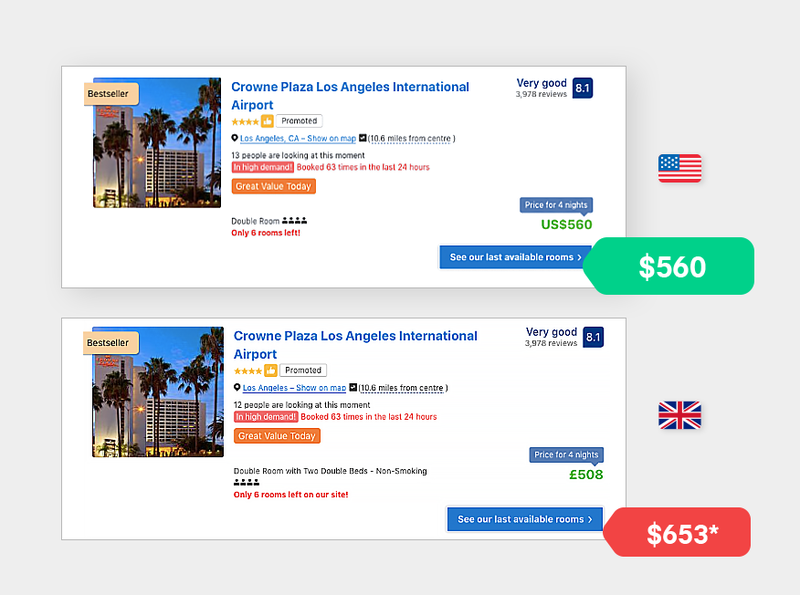 A while ago we did a little research to demonstrate price discrimination when shopping for plane tickets, booking car rentals or hotels, and more. Just by performing a random search on, say, Kayak.com from different Surfshark’s servers, you can save up to $100! Read here to find 9 other examples. Get Surfshark so that your location and identity would be difficult to track. Delete your digital footprint, a.k.a. browsing history, browser cache, and cookies from browser settings. Activate incognito (or private) mode that allows you to browse without saving your history.